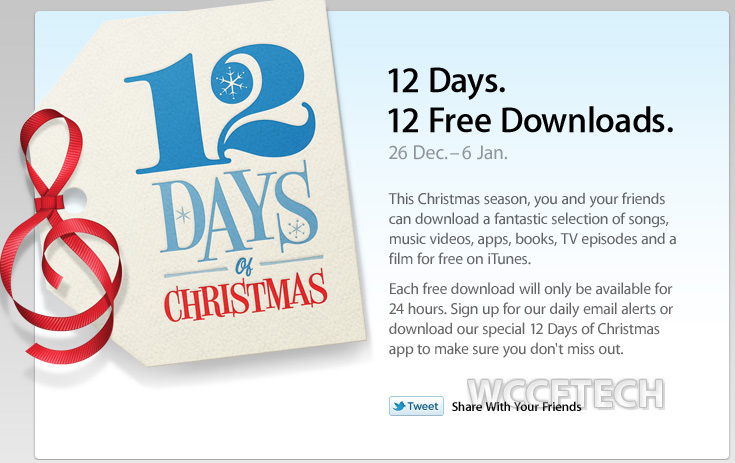 Apple has announced its 12 Days of Christmas giveaway for its European customers saying. “12 Days. 12 Free Downloads”. iTunes’ European customers can download free movies, music, music videos, apps, books, and TV episodes from iTunes. Keep in mind that there’s always a ‘catch’. This Christmas season, you and your friends can download a fantastic selection of songs, music videos, apps, books, TV episodes and a film for free on itunes. Each free download will only be available for 24 hours. Sign up for our daily email alerts or download our special 12 Days of Christmas app to make sure you don’t miss out. The 12 Days of Christmas app hasn’t arrived yet, but you may get it from here when it comes out.